Lately I’ve been dreaming about buying a wonderfully simple and elegant thin gold ring. 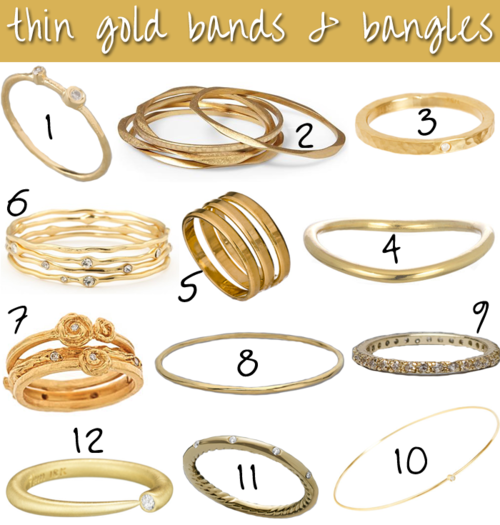 If you buy several that vary in shape, detail and size, you can stack them or wear them separately. The options are endless. Once I do decide to take the plunge and buy one (I’m saving up for a nicer piece like this hammered band by Jennifer Meyer), I am going to wear it as a solitary piece on my index finger. It’s a modern and minimalist way to wear such a bold piece and I think it makes just the right statement when worn next to other more daring pieces.